FILE – In this May 5, 1995 file photo, thousands of search and rescue crews attend a memorial service in front of the Alfred P. Murrah Federal Building in Oklahoma City. More than 600 people were injured in the April 19, 1995 attack and 168 people were killed. Timothy McVeigh was executed in 2001 and Terry Nichols is serving multiple life sentences on federal and state convictions for their convictions in the bombing. Oklahoma Highway Patrol Officer Mike Norman leads dog Nitro on a security check through the Field of Chairs at the Oklahoma City National Memorial, prior to a memorial ceremony Monday, April 19, 2010 on the 15th anniversary of the Oklahoma City bombing. FILE – In this April 19, 1995 file photo, an injured man looks at the bomb damaged Alfred Murrah Federal Building in Oklahoma City. More than 600 people were injured in the attack and 168 people were killed. A victim of the explosion that ripped a nine-story hole in the the Alfred Murrah Federal Building April 19, 1995, in downtown Oklahoma City, is helped from the scene. 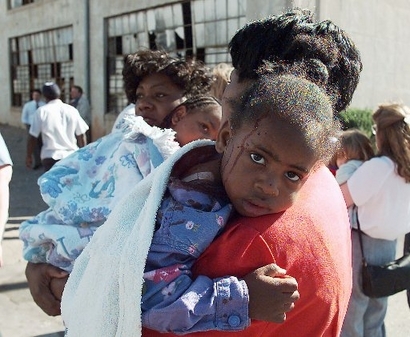 An unidentified woman comforts an injured child following an explosion April 19, 1995, at the Alfred Murrah Federal Building in downtown Oklahoma City. A car bomb blast gouged a nine-story hole in the federal office building. 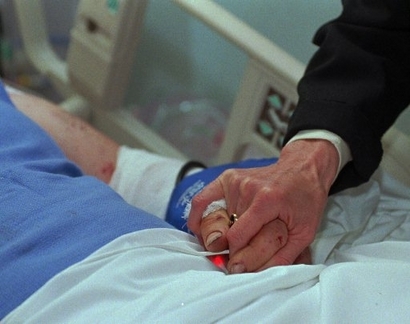 A fingertip monitor glows as Randy Ledger holds his sister’s hand in the intensive care unit of Presbyterian Hospital in Oklahoma City, April 20, 1995. Specked with scars, a breathing tube in his mouth, a gauze patch over a swollen eye, he had lost two-thirds of his blood from a gashed carotid artery during the car bombing of the Alfred P. Murrah federal building. 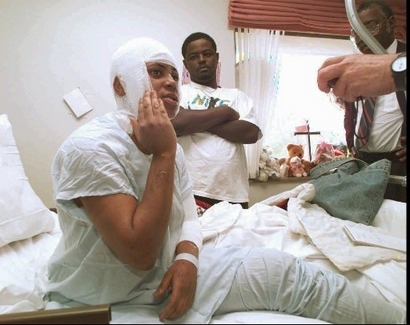 Brandy Ligons, 15, talks from her bed at Children’s Hospital, April 28, 1995, in Oklahoma City, about the injuries she sustained in the car bombing attack in downtown on April 19. In the background is her brother Ronnie. Ligon was the last survivor to be rescued from the rubble of the Alfred P. Murrah federal building. The Reverend Canon Luke Back, of St. Paul’s Cathedral, gives the invocation during the memorial ceremony marking the 15th anniversary of the Oklahoma City bombing, Monday, April 19, 2010, in Oklahoma City. People gather under the Survivor Tree at the Oklahoma City National Memorial, Monday, April 19, 2010, during the memorial ceremony marking the 15th anniversary of the Oklahoma City bombing. Pipe Sergeant Kevin M. Donnelly, of the DEA Black and Gold Pipes and Drums, walks past the Field of Chairs and the Reflecting Pool at the Oklahoma City National Memorial, Monday, April 19, 2010 to start the memorial ceremony on the 15th anniversary of the Oklahoma City bombing, in Oklahoma City. Ila Clark, left, holds her husband Dale Clark, right, of Denham Springs, La., during the reading of the names of the 168 victims of the Oklahoma City bombing, Monday, April 19, 2010, the 15th anniversary of the Oklahoma City bombing, during the memorial ceremony in Oklahoma City. 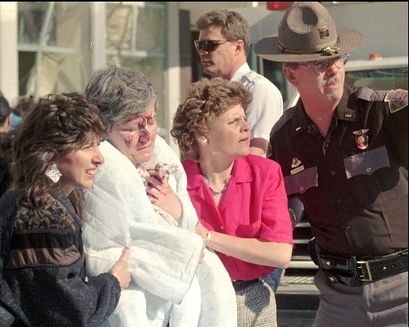 Dale Clark’s sister, Kimberly Clark, was killed in the bombing. Former Oklahoma Gov. Frank Keating, right, speaks during the memorial ceremony for the 15th anniversary of the Oklahoma City bombing, Monday, April 19, 2010, in Oklahoma City, as his wife Cathy looks on at left. Keating was governor during the bombing. From right, U.S. Department of Homeland Security Secretary Janet Napolitano, Oklahoma Gov. Brad Henry, center, and his wife, Kim Henry bow their heads during the memorial ceremony for the 15th anniversary of the Oklahoma City bombing, Monday, April 19, 2010, in Oklahoma City. US Secretary of Homeland Security Janet Napolitano delivers the keynote speech during the 15th anniversary observance ceremony of the Murrah Building bombing in Oklahoma City, Oklahoma. Napolitano urged “vigilance” against violent extremists Monday as the United States marked the 15th anniversary of its deadliest domestic terror attack. Mourners gather for a ceremony for the 168 killed in the 1995 bombing of the federal building in Oklahoma City, Oklahoma. Homeland Security Secretary Janet Napolitano urged “vigilance” against violent extremists Monday as the United States marked the 15th anniversary of its deadliest domestic terror attack. Flowers rest on the chair of Christi Yolanda Jenkins, killed in the Murrah Building bombing, at the Oklahoma City National Memorial before the 15th anniversary observance ceremony of the Murrah Building bombing in Oklahoma City, Oklahoma. Timothy McVeigh detonated a bomb outside the Alfred P. Murrah Federal Building on April 19, 1995, killing 168 people. U.S. Department of Homeland Security Secretary Janet Napolitano speaks Monday, April 19, 2010, at the Oklahoma City National Memorial during the memorial ceremony for the 15th anniversary of the Oklahoma City bombing, in Oklahoma City. Charlene Green, left, hugs Constance Favorite, right, at the chair of Favorite’s daughter, Lakesha Levy, in the Field of Chairs at the Oklahoma City National Memorial, Monday, April 19, 2010, the 15th anniversary of the Oklahoma City bombing. Members of the Perrin Field Honor Guard Corp, made up of Boy Scouts from Pottsboro, Texas, stand during the observance ceremony of the Murrah Building bombing in Oklahoma City, Oklahoma. The United States marked the 15th anniversary of its deadliest domestic terror attack Monday amid rising political tensions and anti-government sentiment. Charlie Hanger, Noble County Sheriff, speaks during the memorial ceremony for the 15th anniversary of the Oklahoma City bombing, Monday, April 19, 2010, in Oklahoma City. Hangar, is the Okahoma Highway Patrol trooper who stopped bomber Timothy McVeigh on the day of the blast because his 1977 Mercury Marquis did not have a license plate. Joyce Bolte stands at the chair of her son, Mark Bolte, in the Field of Chairs at the Oklahoma City National Memorial, Monday, April 19, 2010 on the 15th anniversary of the Oklahoma City bombing. Charlene Green, left, places a flag on the chair of Lakesha Levy, in the Field of Chairs, at the Oklahoma City National Memorial, Monday, April 19, 2010, the 15th anniversary of the Oklahoma City bombing, in Oklahoma City. Levy’s mother, Constance Favorite, is at right. Family and friends of Lakesha Levy, one of the 168 victims of the Oklahoma City bombing, pray at her chair in the Field of Chairs, Monday, April 19, 2010 on the 15th anniversary of the Oklahoma City bombing, in Oklahoma City. FILE – In this May 10, 1995 file photo, Terry Nichols is led by U.S. Marshals from the United States Court House in Wichita, Kan.. More than 600 people were injured in the April 19, 1995 attack on the Alfred P. Murrah federal building in Oklahoma City and 168 people were killed. Timothy McVeigh was executed in 2001 and Terry Nichols is serving multiple life sentences on federal and state convictions for their convictions in the bombing. FILE – In this Jan. 31, 1996 file photo, Timothy McVeigh is escorted by two unidentified U.S. Marshals to a hearing in Federal Court in downtown Oklahoma City. Timothy McVeigh exploded a truck bomb outside the Alfred P. Murrah Federal Building on April 19, 1995, killing 168 people. He was convicted of murder and executed. Timothy McVeigh (C) is led from the Noble County Courthouse in Perry, Oklahoma, after being charged April 21, 1995, with involvement in the bombing of the Alfred P. Murrah Federal Building in Oklahoma City on April 19. The United States will mark the 15th anniversary of the bomning on Monday, amid rising political tensions and anti-government sentiment that has terrorism experts on edge.